Among the first printed illustrated views of the American Revolutionary War. 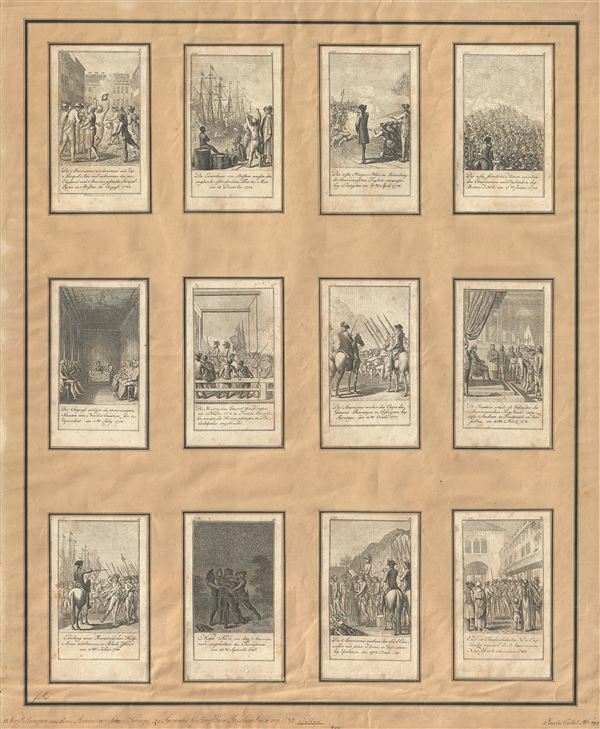 The full set of Chodowiecki's twelve 1784 card views illustrating the American Revolutionary War. Chodowiecki's twelve engraved images are among the first printed illustrations of the events in the colonies and were intended to capitalize on German popular interest in the American Revolution. These views were issued both as cards - such as the present example - and as illustrations in Matthias C. Sprengel's Historisches Taschenbuch. All examples were drawn by Chodowiecki and engraved by Daniel Berger. All cards from the Choloweicki series are extremely scarce, almost never appearing on the market and present in only a few institutional collections. A full set is practically unheard of making this a once in a lifetime collecting opportunity. Die Americaner wiedersetzen sich de Stempel-Acte, ... This card, the first in the series, illustrates American protests over the unjust 1765 Stamp Act. While most colonists simply refused to use the stamps, protesters in Boston became more violent, destroying crown property and burning the Stamp Act proclamations. Note the date printed in the caption, 1764, is incorrect. Cresswell 243. Die Einwohner von Boston wersen den englisch-ostindischen ... The second in Chodowiecki's's series, this cart illustrates the December 16, 1773 Boston Tea Party, during which Bostonians, discuised as American Indians, attached British East India company ships destryong 34.2 chests of tea. Like the first of this series, Chodowiecki has the date wrong, being December 16, not December 18, as rendered. Cresswell 248. Das erste Burger Blut, ... The third card represents the April 19th, 1775 Battle of Lexington. The image shows British regulars firing on a disorganized rabble representing the Massachusetts Militia. Again, the date in the caption is incorrect. Cresswell 251. Die erste formliche Action zwischen ... Card no. 4 illustrates the Battle of Bunker Hill, a British victory at heavy cost. Again, the date in the caption is incorrect. Cresswell 254. Der Congress erklert die 13 vereinigten Staaten ... The fifth card in this series illustrates the Second Continental Congress, consisting of representation from each of the 13 colonies. It was this congress that officially adopted the Declaration of Independence. This time the date, July 1776, is correct. Cresswell 261. Die Hessen, vom General Washington ...The card, the sixth, shows General Washington after the Battle of Trenton - where he famously crossed the Delaware River against adverse conditions to capture a much larger Hessian force almost without Continental casualties. Cresswell 271. Die Americaner machen das Corps des General Bourgoyne ... This card, the seventh, illustrates the surrender of General Burgoyne at Saratoga, a decisive event this Continental victory is considered to be the turning point in the American Revolutionary War. Cresswell 275. Dr. Franklin erhalt, ... Card no. 8 depicts Benjamin Franklin's 1778 reception by Louis XVI at the French court at Versailles. It was here, bolstered by the victory at Saratoga, that Franklin was able to secure French military support for the Continental cause. Cresswell 277. Landung einer Franzosischen ... This card, the ninth, illustrates the arrival at Newport, Rhode Island, of a 5,500 man French army under the Comte de Rochambeau. Cresswell 318. Major Andre, von drey Americanern ... The tenth card shows Major John Andre being taken into custody by three men, John Paulding, Isaac Van Wart, and David Williams, near Tarrytown, New York. Andre was a British intelligence officer tried and executed for his association with Benedict Arnold and the attempted surrender of West Point. Andre, incidentally, was also accused of having an affair with Arnold's loyalist wife, Peggy Shippen. Not in Cresswell. Die Americaner machen den Lord Cornwallis ... The eleventh card illustrates the surrender of the British commander General Cornwallis at Yorktown - the decisive final Battle of the American Revolutionary War. Cresswell 327. Ende der Feindseeligkeiten Die Englander raumen den Americanern Neu-Yorck un .... This view, no. 14 of the series, illustrates the events of November 25, 1783, commonly called 'Evacuation Day,' when last British troops abandoned Manhattan. Chodowiecki here recreates the scene wherein red coat officers gather while a man, woman, and American Indian family look on. This is also the day when the last shot of the American Revolution War was fired; the departing British ship fired its canon at jeering crowds on Staten Island. The shot never hit its target. The British departure was shortly followed by General Washington and Continental Army victorious entrance. Cresswell 343. Daniel Nicholas Chodowiecki (October 16, 1726 - February 7, 1801) was a Polish-German engraver and painter active in Berlin during the second half of the 18th century. Chodowiecki was born in Danzig (Gdansk), Poland of a middle class Huguenot family. When is father passed away Chodowiecki relocated to Berlin, Germany. In 1764 he enrolled in the Berlin Academy where he mastered drawing, engraving, and printmaking. By 1788 he had become Vice-Director of the Academy. He rose in prominence as one of the finest graphic artists of his day, producing a broad corpus of work that ranged from political commentary to literary and scientific illustration. In printmaking, he is credited with the invention of the deliberate remarque, a small sketch on a plate, lying outside the main image. These were originally little sketches or doodles by artists, not really meant to be seen, but Chodowiecki turned them into "bonus items" for collectors. He was exceptionally known for his trade card size miniatures which he issued serially on topic ranging from Shakespeare to the French Revolution. Historically, his most important work is most likely his 12 card set illustrating the events of the American Revolutionary War which rank among the earliest printed images of the war. Gottfried Daniel Berger (October 25, 1744 - November 17, 1825) was a German engraver. Born in Berlin, Berger was the son of Friedrich Gottlieb Berger who was also an engraver. In 1757 Berger was being instructed by the French painter Blaise Nicholas Le Sueur, who at the time was the director of the Prussian Academy of Arts. In May 1774, his training was further supplemented by Georg Friedrich Schmidt until the artist's death eight months later. Berger received professional support from Le Sueur, who provided contacts with influential figures including the painter and director of the Sanssouci Picture Gallery Matthias of Austria, the bank director and art connoisseur Carl Philipp Caesar, anatomy professor Johann Friedrich Meckel, and artist Daniel Chodowiecki. Berger received numerous important commissions, such as the production of illustrations for medical and biological works or reproductions of paintings. By 1778, Berger was a full member of the Academy of Arts, and in 1787 he was inducted into the rectorship and was appointed professor of engraving. In 1816, Berger became Vice Director of the Academy. He died November 17, 1825 in Berlin. Sprengel, Matthias C., Historisches Taschenbuch, (Leipzig: bey Haude & Berlin : von Spener) 1784. Also Issued Independently. Very good. Mounted on 19th century (easily removable by a restorer) paper with French style manuscript borders. Individual cards exhibit some toning, else fine examples. Given size as depicted above. Cresswell, D., The American Revolution in Drawings and Prints, p. 125, no. 343. Boston Athenum, Prints and Photographs, AA B64N48 Hi.(no.1). Exhibited in: 'Creating the United States' at the Library of Congress, Washington, D.C., 2011.